As you know, it’s supposed to be lucky to eat black-eyed peas on New Year’s Day. 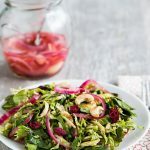 Every year around this time I scour my cookbooks and my imagination for new ways to cook them because the way I grew up eating them was, frankly, a little boring–as well as not vegetarian. Last year I made Creole Black-eyed Peas, and though I missed New Year’s by a few days, I think I had a fairly lucky year. I renewed my luck in May by making Spicy Collards and Black-eyed Peas–two lucky foods in one dish. 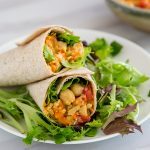 One of my favorite black-eyed pea dishes, Texas Caviar, hasn’t made an appearance on this blog, and since it’s a salad, I think it will have to wait until the temperature is above freezing. When I read about moin-moin (or moyin-moyin), a savory Nigerian pudding or cake made of black-eyed peas, I was very intrigued. 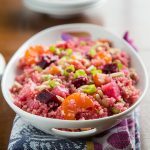 Information about it was hard to come by, however, because every website I found was passing around the same, identical recipe. Finally, I happened upon a post by Fran Osseo-Asare –complete with video–at BetumiBlog that filled in all the blanks. I learned a great trick for getting the skins off of the black-eyed peas (you literally rub the black-eyes off, what fun!) 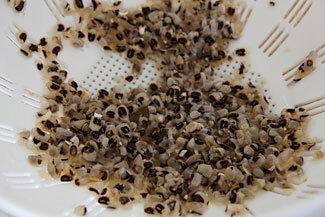 and discovered that you can cut up pieces of moin-moin and serve it on toothpicks as an appetizer, as shown above. Moin-moin seems to be very versatile: You can eat it cold or hot, as a part of a meal or as a snack. There are similar dishes made of ground black-eyed peas throughout western and central Africa, including akara, a fritter with mostly the same ingredients. The traditional way to make moin-moin is to steam it in banana leaves or, when they are not available, aluminum foil. For my first attempt at making moin-moin, I used small ramekins instead–or, to be more exact, I used the six ramekins I had and used foil packets for the other two servings. Dealing with the ramekins was easier than making and filling foil packets, so that is the technique that I’m illustrating here. If you’re interested in using aluminum foil, do check out the videos on the BetumiBlog. 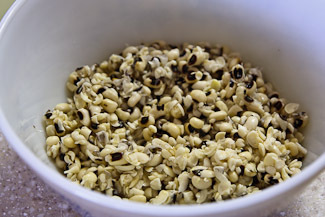 These little cakes or puddings are mildly seasoned, which seems to be traditional, but have the strong, characteristic taste of black-eyed peas. I found no mention of serving them with any type of sauce, but being a saucy Louisianian, I couldn’t resist eating them with some spicy cocktail sauce (a mixture of ketchup, horseradish, and hot sauce). 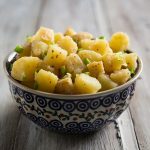 Their mild flavor would be complemented by any number of sauces, though give them a try alone first so that you can appreciate their simple, savory flavor. Serve them with some Quick and Delicious Collards and reap your lucky rewards in the new year! Wash the peas and pick over them to remove any debris. Put them into a large bowl and cover with hot water at least two inches above the level of the peas. Soak for at least one hour. Drain off the soaking water and place the peas in a food processor. Pulse briefly about 12 times, until peas are just barely broken. Pour the peas back into the bowl and cover with water. Rub the peas between your hands, removing the skins. The skins will float to the top. Pour off the skins, into a colander, and repeat this process several times. Once the skins are removed, the peas will be white. It’s not necessary to get off every single skin, but try to remove as many as possible. Put the skinned peas back into the processor. Add the chopped onion, roasted red pepper, tomato paste, and about 2 tablespoons of vegetable broth. Process until completely smooth (this may take a few minutes, depending on your processor). Pour the mixture back into the bowl. Stir in the Old Bay seasoning (or other, see Note below), salt, and white pepper. 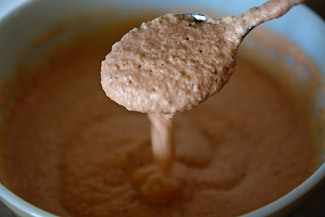 Add a tablespoon or two of vegetable broth, if necessary, to make a thick but pourable slurry. Heat water in a steamer or deep pot with a steamer basket set over it. Oil 8 ramekins. Pour a scant 1/2 cup of the batter into each ramekin and cover with aluminum foil. Set ramekins into steamer. Steam for about 35 minutes, or until a toothpick inserted in the center of a ramekin comes out fairly clean. 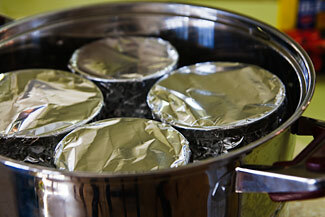 Keep covered with foil to preserve moistness until ready to serve. Note: You may use any seasoned salt instead of the Old Bay and salt. Use about 1 1/2 – 2 teaspoons and add more to taste. Makes 8 cakes. Per serving (2 cakes): 158 Calories (kcal); 1g Total Fat; (3% calories from fat); 10g Protein; 29g Carbohydrate; 0mg Cholesterol; 606mg Sodium; 5g Fiber. Weight Watchers: Core / 2 Points. you just cured my home sickness lol. thanks for sharing! I’m Nigerian, and this dish is a staple at our household. It’s delicious and is very versatile, like you mentioned. Thanks so much for sharing! Susan, Bravo. I love moin-moin and your explanation and receipe is exact. The visual display added autheticity. I am really impressed that you took the time to find this and I bet you proabably make it better than some Nigerians. I loe it but find it to be labor intensive but I got a clue – to soak in boiled water as opposed to cold. A variation of the plain moin -moin will be vegetable additions and/or additional proteing such as egges, shrimp and so on. How do you determine caloric content per serving? 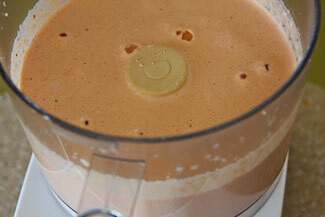 I find that if I add an egg to the blend, it keeps the moi-moi from becoming a dense mass when it cools. 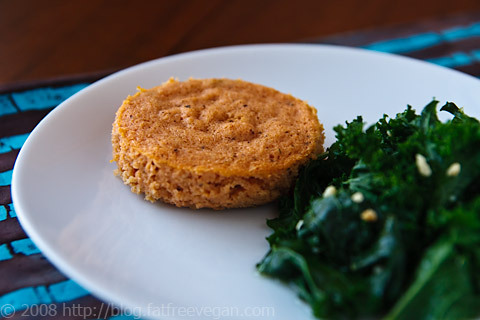 I’m a Nigerian Vegan and it never once crossed my mind that I could make moimoi vegan! I’m so used to seeing it with eggs, fish and shrimp. That said, I do have a trick that can cut down the prep time. If you check a local ethnic/African food store they might stock “Bean Powder”. It is just powered beans and all you have to do is hydrate it with some cold stock, tomato , pepper and seasoning. 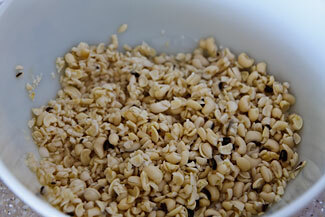 I’m going to make Bollitos de Carita. i have recently grown to love this local delicacy and have eaten it at least 8times weekly in the past 1 year in my attempt to shed some weight, the good thing is that i never seem to tire of it. Love the way you made out your Moi-moi. But next time just buy the Beans flour and make it out. That cuts out a lot of time and till gives you great moi moi. Better save time. Thanks for this recipe! 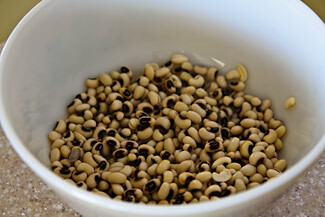 Have fallen in love with blackeyed peas and am working my way through all the great ways to make them. Question: can these little cakes be steamed then kept in the fridge a day or two or must they be made fresh for each meal? Best blessings! Sure! Just keep them covered in the refrigerator, and they should be fine. Thank you, I will definitely be trying this. It looks similar to a Dhokla (Indian chickpea flour steamed cake) which I really like. Have you ever made that? 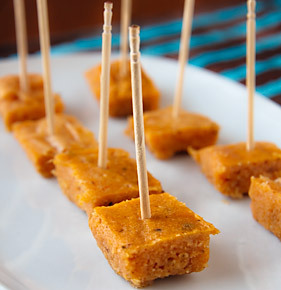 I’d be very interested to see your version of a Khaman Dhokla, especially the topping (tadka) that uses oil. When she said she’s a spicy Louisianan I lost it. White people truly don’t know how to stay in their lane. You ruined an authentic African dish with your caucsity.